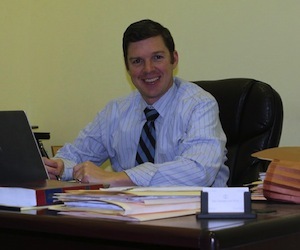 Prior to founding The Cloutier Law Firm, attorney Kevin M. Cloutier worked as an Assistant District Attorney in the Suffolk County District Attorney’s Office for five years. He joined the office immediately after taking the bar exam in 2005. During his tenure, attorney Cloutier prosecuted thousands of cases in the Boston Municipal Court divisions in Dorchester, South Boston, Charlestown, East Boston, Brighton and ultimately in the Superior Court as a member of the Major Felony Unit. Attorney Cloutier prosecuted cases involving violent offenses, domestic violence, the distribution and possession of narcotics, weapons possession, drunk-driving, larceny, indecent assault and battery and welfare fraud. Attorney Cloutier began his legal career as a legal intern for the Boston Police Department’s Legal Advisor during the summer of 2004. He primarily focused on providing legal research and courtroom preparation on civil rights and security issues surrounding the Democratic National Convention held at the Boston Garden that Summer. Attorney Cloutier also worked as a paralegal at the law firm of Cloutier & Cassella, LLC in Old Saybrook, CT throughout law school. Cloutier & Cassella, LLC is a general practice firm that was managed by Kevin’s late father, Thomas A. Cloutier. Attorney Kevin Cloutier credits the work of his father for his commitment to the practice of law on behalf of aggrieved individuals and their families. For over thirty years, Tom Cloutier’s practice became a mainstay for the families and businesses along the Connecticut shoreline, culminating in Tom’s election as President of the Connecticut Trial Lawyers Association in 2001. Attorney Kevin Cloutier returned to Cloutier & Cassella in the summer of 2011 when Tom Cloutier passed away. Attorney Cloutier assisted his father’s partners in trial research and preparation during this difficult period and Cloutier & Cassella, LLC continues to be one of the most respected litigation firms in Connecticut. Attorney Cloutier is a veteran of the Iraq war during which he commanded a multi-functional intelligence team in support of the 1-8 Infantry Battalion of the Third Brigade, Fourth Infantry Division. After returning from Iraq, Attorney Cloutier took Command of Alpha Company, 325th Military Intelligence Battalion. He currently holds the rank of Captain and is still active in the Reserves. Attorney Cloutier lives in West Roxbury with his wife and two sons.